The Mmankala Commercial & Technical School is situated in Makapanstad, North West Province. The school was commissioned by the province’s Department of Education. The school provides technical education for high school pupils from the community. The design comprises classrooms and workshops that branch out from a circular covered walkway. The shape of the walkway enables passive surveillance, easy transition between classes and creates a central assembly space as well as making provision for future additions to the school. The circular walkway is covered by a steel roof. This roof material is ideal for this application as it could be constructed in segments. These segments overlap to form the circular shape of the walkway. The chosen roof construction method provided the flexibility to adapt and adjust the roof and roof levels during the installation process. The roof heights vary to accentuate and indicate access points to the different classrooms, workshops, administration building and nutrition centre. The project’s workshops establish the guidelines for the new departmental norms. The rural location of the site influenced the choice of building material. The considerations of construction materials included the ease of construction, time of construction and the minimisation of building materials on site. These considerations led to steel being selected as a prime construction material. A steel frame adheres to all of the factors taken into consideration with the advantage of off-site manufacture. The frames could then be transported to site and erected within a short period of time and then filled with masonry using semi-skilled labour from the community. The educational function of the project dictates that the building materials used ought to be robust and low maintenance. The steel frames, providing the structure of the workshops, comply, perfect for a school and workshop environment. The workshops are divided into theory, practical, storage and ablution areas. The steel construction in these areas is exposed and used to educate the pupils about steel construction. The exposed structure also enables the retrofitting of technical equipment such as a block and tackle. The design makes use of steel fenestration and doors throughout the school. Steel pivot window frames with cottage panes are used in classrooms. In the workshops, these windows are placed at a high level to avoid strong breezes on table surfaces. The pivoting of the windows is such that it would promote natural ventilation whilst being easy to open and close. The cottage pane design of the frames allows for easy replacement of broken glass panes and easy installation of burglar bars. The steel doors are fitted with fixed louvers that permit natural ventilation even though windows and doors may be closed. Steel finishes can be exploited and explored in a variety of ways to suit the aesthetic qualities of a design. 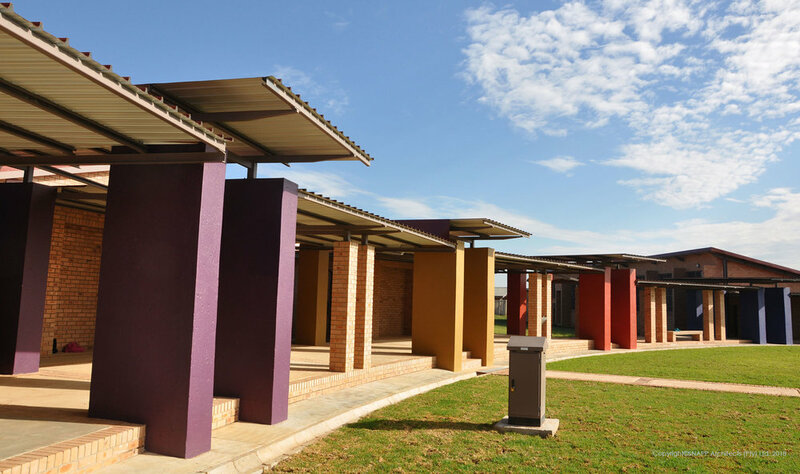 In the case of the Mmankala Commercial & Technical School, the steel doors and door frames are painted in bright colours to differentiate between different spaces and also to emphasise the educational nature of the project. It is the design team’s belief that the use of steel as a prominent construction material for the project contributed greatly toward the ease of construction of the project. The use of steel binds the project together as a cohesive whole and educates the next generation about construction.